When a strange set of circumstances literally tears down therapist Brook Ogden’s practice, she finds herself facing an uncertain future. But an offhand comment from her best friend, Sasha, plants a seed in Brook’s mind and, before she knows it, she has a weekly newspaper column offering advice to those going through a breakup. 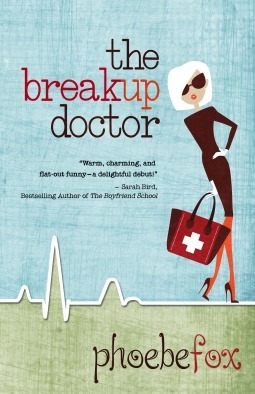 Clients begin to trickle in to the newly-minted Breakup Doctor . . . just when Brook may need her own services and advice! Phoebe Fox’s debut is delightful. It was the perfect break for me after reading back-to-back-to-back cozy mysteries! (Which I thoroughly enjoy, don’t get me wrong; but a girl needs a little variety, too, am I right?) The story is sharp, witty, funny, and fast-paced. Brook’s narration is a great balance of wisdom and self-deprecation, with a healthy dose of snark to make the reader snicker. The plot premise of The Breakup Doctor is such a great one. A relationship expert who suddenly finds herself out of what seemed to be the perfect relationship. “Physician: heal thyself,” right? Um, wrong. Instead of relying on the advice she so easily doles out to her clients – and her best friend – Brook starts doing all the wrong things. And the results are both hilarious and heart-breaking. This was such an enjoyable read and I send my thanks to the good chickens at Henery Press, who gifted me an advance copy of the book in exchange for this review. I’m also excited to share that Phoebe Fox is already hard at work on the follow-up book! I can’t wait to see what Brook gets up to next!